It started last Tuesday, just a little past midnight, when I couldn't seem to doze off. I opened my laptop and looked for a movie to put me to sleep, something somber and familiar, preferably with subtitles. I settled on Wong Kar-wai's In the Mood for Love, but instead of putting me to sleep, the film, during the scene where Mrs. Chan goes out for take-out noodles, only made me hungry. I snacked on a soft-boiled egg and wheat crackers to satisfy my hunger, but I was left with a really intense craving for Chinese noodles. The magnificent Maggie Cheung as Mrs. Chan in In the Mood for Love. 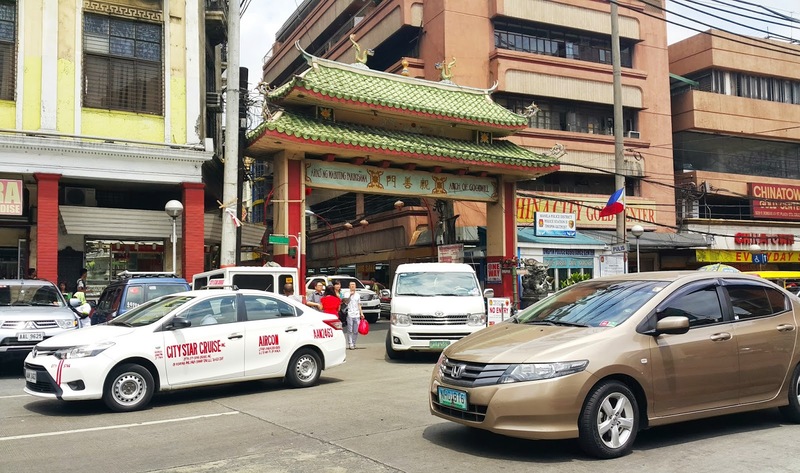 There are several places I could easily go to for authentic Chinese food (Causeway and Yang Chow in Libis, for instance), but I've always wanted to return to Binondo since being taken there two years ago by my dear friend Seddy. So that's what I did in the weekend. With a special date. Albeit four days late to satisfy my noodle craving. It was Saturday, and the heat, thank goodness, was bearable enough for commuting. One UV Express shuttle and two train rides took us from Pasig to Binondo just before lunchtime, and the very first recommended restaurant we came upon, based on a list I had compiled from the Internet, was The Original SaLido Restaurant located along Ongpin St. 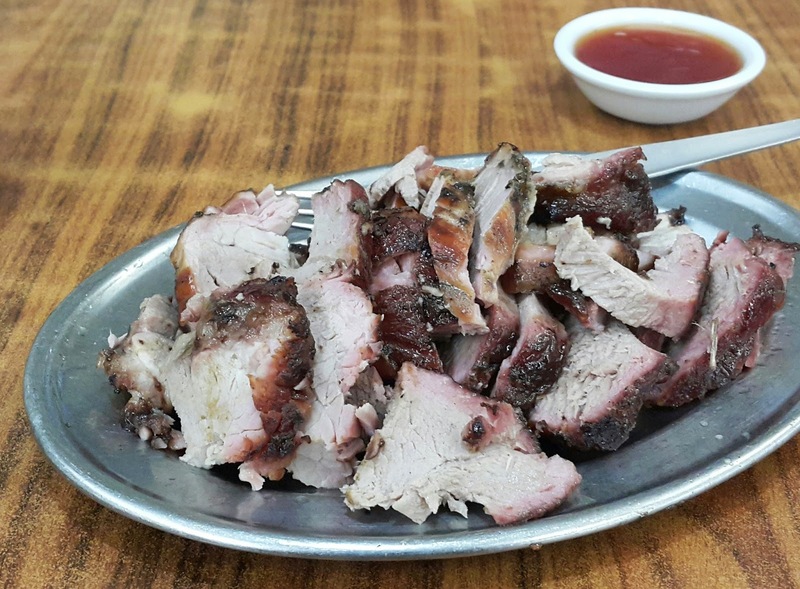 The place claimed to be "Home of the Famous Asado," so we ordered a small plate of the pork dish for P245. The Original SaLido Restaurant's so-called asado. 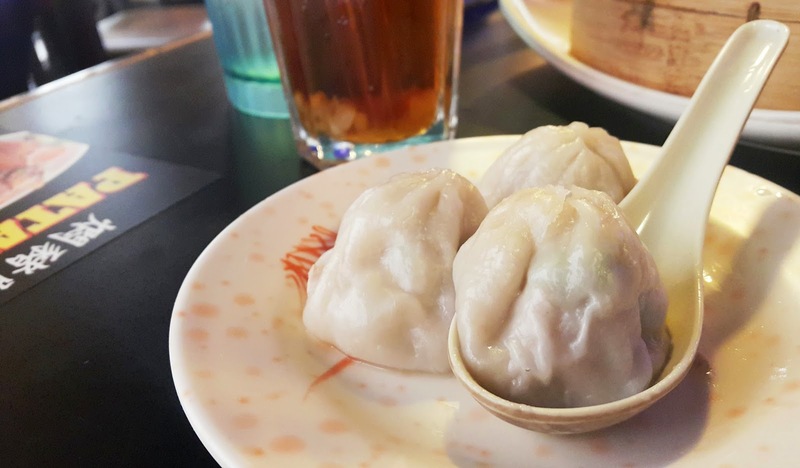 Shanghai Fried Siopao, almost nondescript, so keep an eye out for it along Ongpin St. if you'd like some of their fried siopao. 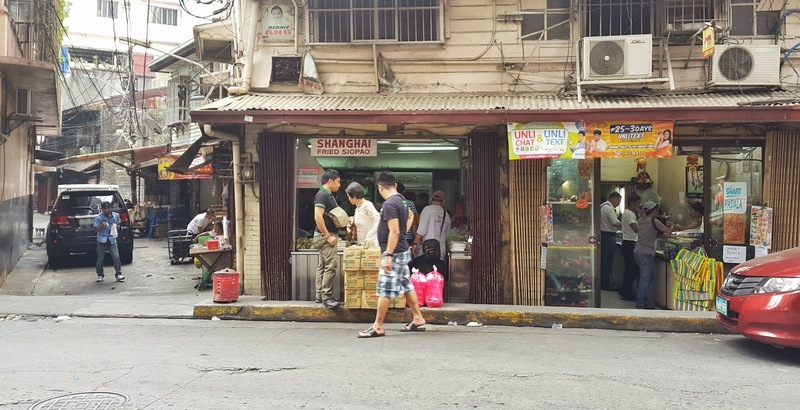 We immediately left SaLido and walked along Ongpin till we reached Shanghai Fried Siopao. We each got a fried siopao (P18 per piece), which I've tried before but whose taste still surprised me, being used to the Bicol-style toasted siopao sold a few blocks away from my place in Pasig. Their similarity is that they both don't need any sauce to enhance their taste. 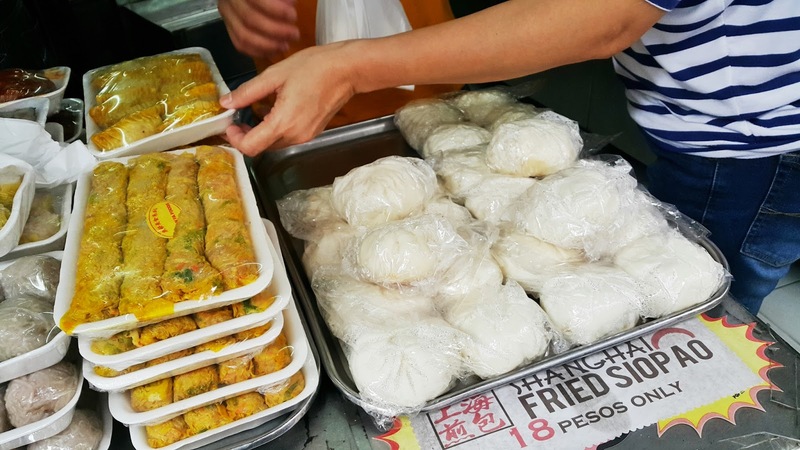 But only the bottom of the fried siopao is toasted, and—a word of caution for those with food sensitivity—the buns are prepared and packed in plastic bags using bare hands. 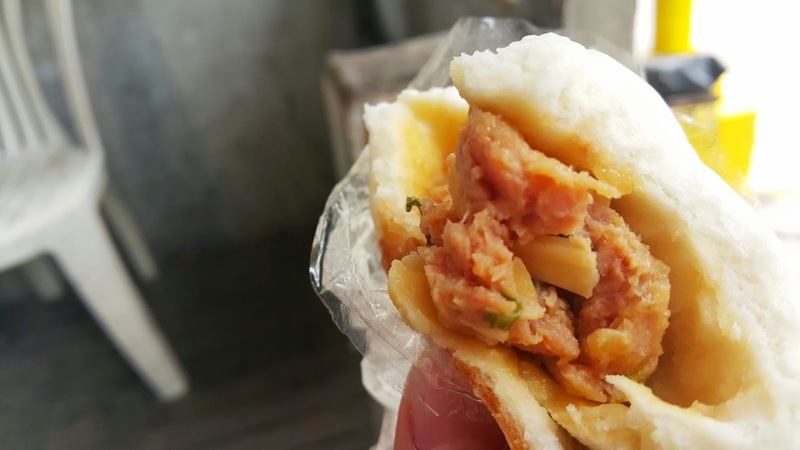 Shanghai Fried Siopao doesn't just sell fried siopao but other Chinese delicacies too. By the time we were finished with our siopao, we already had a hankering for a complete meal. So we headed to Wai Ying Fastfood, which was this hole-in-the-wall joint Seddy took me to before and whose white chicken with ginger-garlic relish still haunts my daydreams. 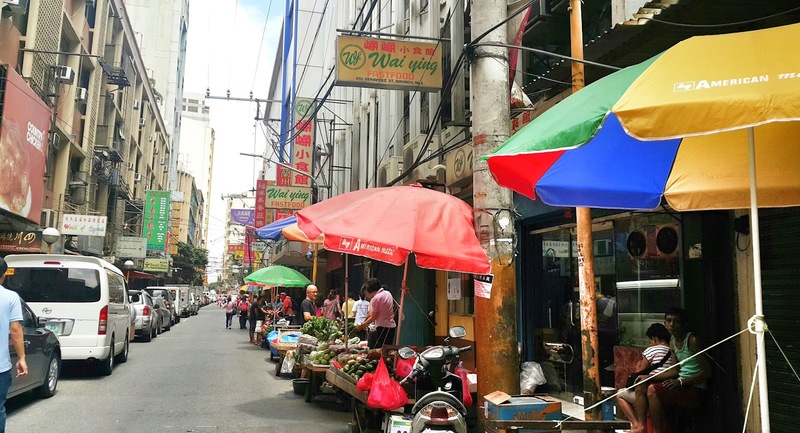 There are two Wai Yings in Binondo: the restaurant which has two floors, and the take-out joint. Wai Ying had a lot that we could have ordered, but we were not yet done restaurant-hopping so we only got half an order of the white chicken (P190), no rice, and hakao (P80). I've had better hakao but I've never liked ginger in any dish other than in Wai Ying's luya relish, which I slathered on each cut of chicken I inhaled. To wash it down, I had cold milk tea while my date had cold lemon tea (both P55 a glass). 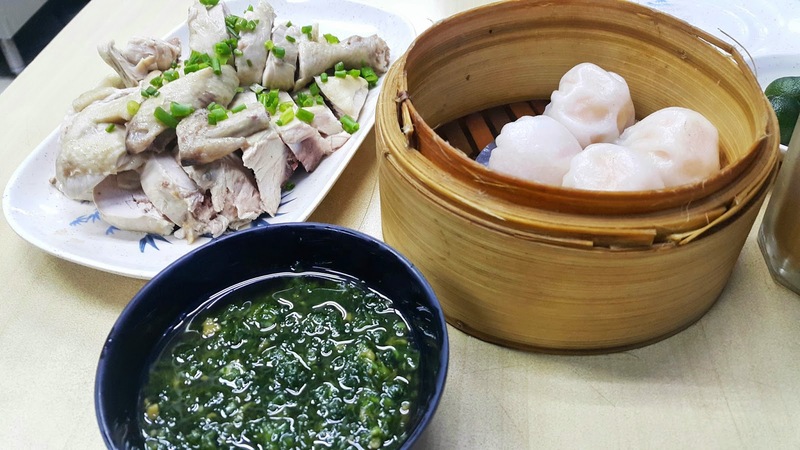 Wai Ying's white chicken and its luya relish, and hakao. The chicken and hakao had already made us a bit full so we skipped having mami at Masuki Mami Restaurant, which was also just along Benavidez St. Instead, we went to Cafe Mezzanine, famous for their kiampong and Soup No. 5 and for donating all the revenue from their firehouse-themed restaurant to the Binondo Paco Fire Search and Rescue Brigade. We weren't adventurous enough to order Soup No. 5 so we got their xiao long bao, affordable at P180 for ten dumplings, and their wintermelon juice, priced at P65 a glass. We couldn't finish the xiao long bao, though that might have been because the dumplings' flour skin tasted a little too street siomai-like. The wintermelon juice, on the other hand, was delightfully refreshing and I enjoyed munching on the sweet wintermelon bits. Cafe Mezzanine's xiao long bao. It was drizzling when we left Cafe Mezzanine to line up at Eng Bee Tin for hopia. I had gotten addicted to Eng Bee Tin's hopia piña (pineapple) ever since my dad started occasionally bringing it home as pasalubong when I was a kid, so I bought six packs of those (P38 each) and four packs of their more popular custard hopia (P50 each). The place was filled with women hoarding various types of Eng Bee Tin pastries and making sure their purchases weren't going to expire earlier than May, so even though we could have eaten our hopia there at one of their tables, we opted to just leave for Lord Stow's for a proper dessert. The crowd at Eng Bee Tin, all hungry for hopia. 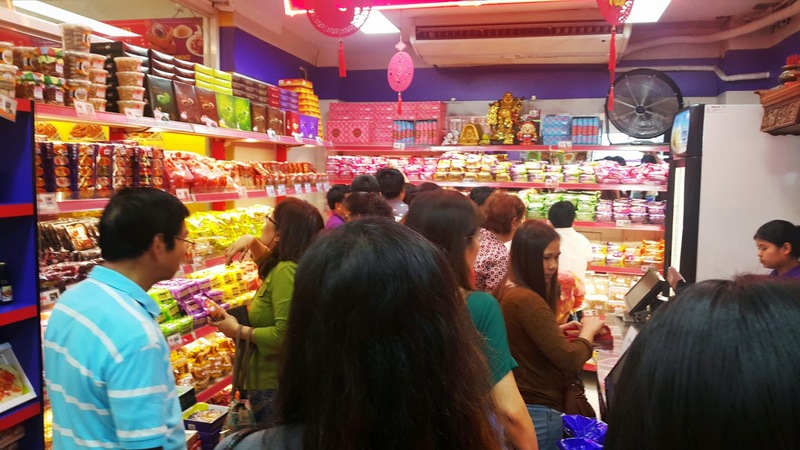 Lord Stow's Bakery was also packed with women hoarding pastries that Saturday. My date and I ordered a small box of four egg tarts (P165, but bought individually an egg tart is P42) and ate them at the far end of the counter while listening to an old Chinese guy intermittently talk business on the phone. Considering how tiny the bakeshop was, it was loud. Eventually the place emptied out though, allowing us to finish our egg tarts in peace. 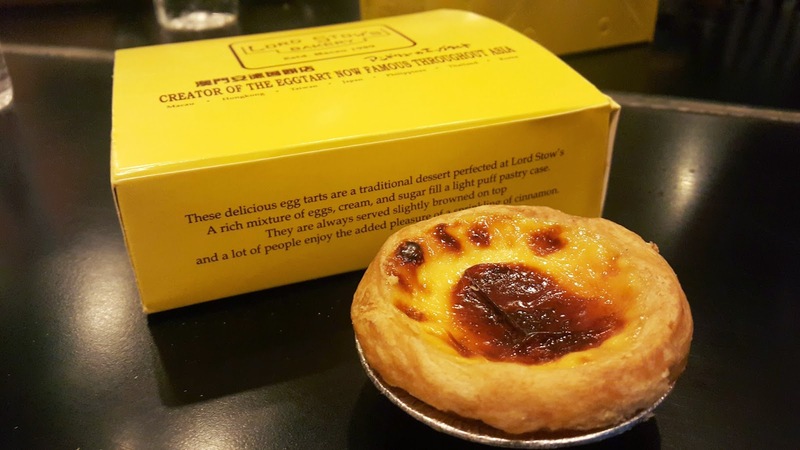 The cronut of Asia and the 1990s: egg tart from Lord Stow's Bakery. Lord Stow's egg tarts may not be Chinese at all (Lord Stow's Bakery first opened in Macau, but "Lord" Andrew Stow is English and his inspiration for his egg tarts, pasteis de nata, is Portuguese), but its flaky, creamy and slightly sweet goodness was the perfect way to end our food tour in the world's oldest Chinatown. Aside from Masuki, we also weren't able to go to several other food stops in my list, such as Quick Snack, New Po-Heng Lumpia House, Dong Bei Dumplings, LGA Estero (famous for their fried frog legs, which my date was thankful I wasn't keen to try), Ying Ying Tea House and Sincerity Cafe. Restaurants like President Tea House we deliberately didn't visit because they have branches outside Binondo anyway. My In the Mood for Love-induced craving wasn't satisfied, but we were surrounded by so much Chinese food in Binondo I forgot that noodles were what I had intended to eat there in the first place. All in all, costing just P600 for each of us (not including transportation and the pasalubong from Eng Bee Tin), it was a fun and satisfying but inexpensive Manila Chinatown food tour. I'll be sure to visit more restos next time. Maybe on another date.